Are you considering the 2018 Jeep Grand Cherokee vs 2018 GMC Acadia? These midsize SUVs are two competitors in a very crowded class of vehicles. Here’s what you need to know if you’re trying to decide between the Grand Cherokee, which seats five passengers, and the Acadia, a three-row model that can accommodate either six or seven passengers. Pollard Jeep serving Boulder Longmont Fort Collins is your source for the 2018 Grand Cherokee. Jeep Grand Cherokee drivers can choose from an impressive selection of powertrains, making this the ideal midsize SUV for just about everyone. The base model has a V6 that boasts a solid 295 horses. Next up is a selection of V8s that offer 360, 475, and an incredible 707 horsepower in the all-new Trackhawk trim. You can also choose a V6 EcoDiesel that can tow up to 6,800 pounds. Each is paired with an eight-speed automatic transmission. Towing capacity tops out at 7,200 pounds, among the best numbers in the midsize SUV class. 2018 GMC Acadia drivers can choose from either a 193-hp four-cylinder engine or a 310-hp V6. Both are paired with a six-speed automatic transmission. Front-wheel drive is standard, but all-wheel drive is available as an upgrade. The Acadia is not rated for towing. Reviewers say the Grand Cherokee boasts spacious seats even in the rear, while the rear seats in the Acadia are better suited for children than adults. Both vehicles can be upgraded with leather upholstery, but only the Grand Cherokee offers premium suede and Nappa leather options. Both vehicles are available with a dual-pane sunroof. The 2018 Jeep Grand Cherokee is perfect for road trips, offering more than 36 cubic feet of cargo space that increases to more than 68 cubic feet with the second row folded flat. If you opt for the Acadia you’ll have more than 79 cubic feet with both the second and third rows folded, but less than 13 cubic feet when the seats are in use. If you opt for the EcoDiesel Grand Cherokee, you’ll get an EPA-estimated 22/30 city/highway miles per gallon. With the Acadia, you’ll get 21/26 mpg with the base engine and 18/25 with the V6. 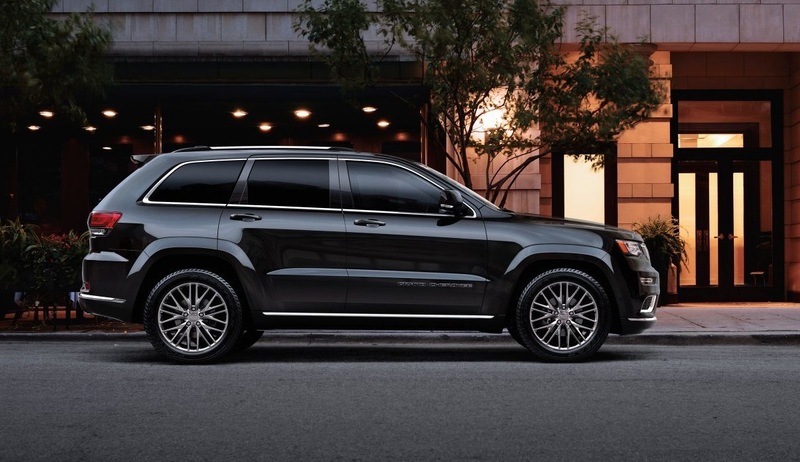 If you want to take your midsize SUV on tough trail-based terrain, opt for the Grand Cherokee. The Trailhawk trim is specifically designed for off-roading and comes equipped with a premium QuadraDrive four-wheel-drive system, limited slip differential, air traction control, and five selectable terrain settings as well as a tow hitch. No GMC model is similarly equipped. 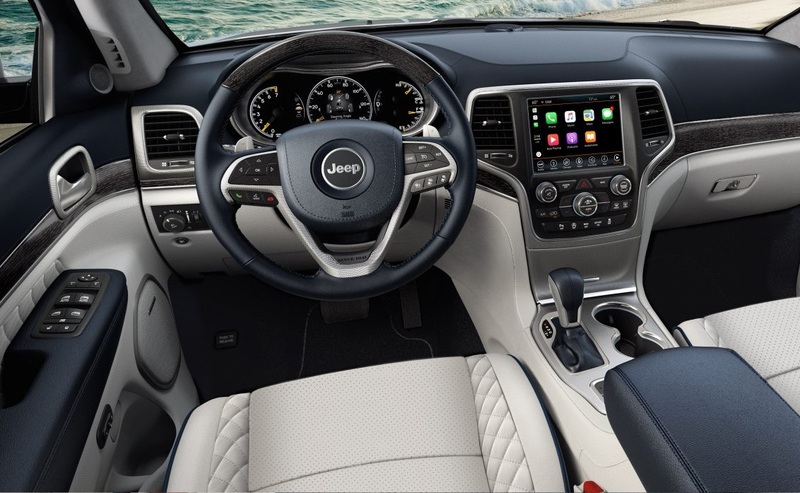 New for 2018, the Grand Cherokee now comes standard with a 7-inch touchscreen that supports Apple CarPlay and Android Auto smartphone integration along with Bluetooth. This set-up is also included in the Acadia, though the Jeep’s touchscreen can be upgraded to an 8.4-inch model. Both vehicles also come standard with a six-speaker audio system. Both the Grand Cherokee and the Acadia come with a standard rearview camera, while the Jeep adds rear parking sensors and the GMC adds teen driver and rear-seat reminder functions. Both vehicles can be upgraded with additional driver assistance features, including blind spot monitoring, forward collision warning with active braking, and rear cross-traffic alert. The Grand Cherokee is also available with adaptive cruise control, automatic windshield wipers, and automatic high beams. The Jeep Grand Cherokee was named the Four Wheeler SUV of the Year, ranked as Best in Class by AutoPacific, and is rated as the highest in customer loyalty among midsize SUVs for the third consecutive year by IHS Markit. The firm also noted that more customers are currently switching to Jeep than any other brand. It’s clear that Jeep comes out ahead in the question of 2018 Jeep Grand Cherokee vs 2018 GMC Acadia. If you’re in the market for a new midsize SUV, visit us at Pollard Jeep in Boulder to test drive the 2018 Jeep Grand Cherokee and see how it compares to the 2018 GMC Acadia.